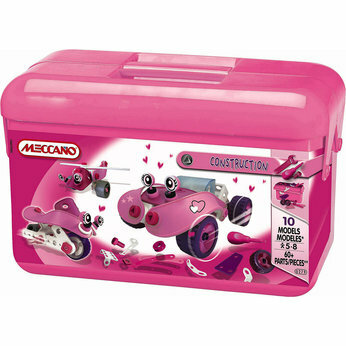 A Mothers Ramblings: Meccano Construction - For Girls! At the start of every term Top Ender brings home a sheet of coloured paper which lists the various lunchtime and after school clubs that are available for the School Children to join for the term. They are all run by the teachers donating their time and I for one am very grateful. In fact any teacher, school worker or volunteer at any School you have my gratitude! I was quite excited that Top Ender wanted to join construction club, from what I could tell from the information given the club is about using the materials available to build what ever they want. From what I have heard of Construction Club, Top Ender is really enjoying it and is enjoying using materials other than the Lego, Wooden Bricks and Mega Bloks that we have at home. It was when a pink tool box of Meccano arrived at home that I got to see how great Top Ender's skills have really developed. Top Ender opened the box and started to construct a car following the instructions that were inside the box. She put it together and pushed it along, she then took it apart and quickly made a motorbike. She took that apart and made wind skating board and all without help from Daddy or me! I think that the pink tub is a great idea, because it has allowed Top Ender to combine her favourite colours with a new hobby. It's a great starter set, that Top Ender is going to donate to Construction Club and hopefully all the other club members will enjoy playing with too!